It was probably the most watched TV debate duel in history with up to 80 more than million viewers. 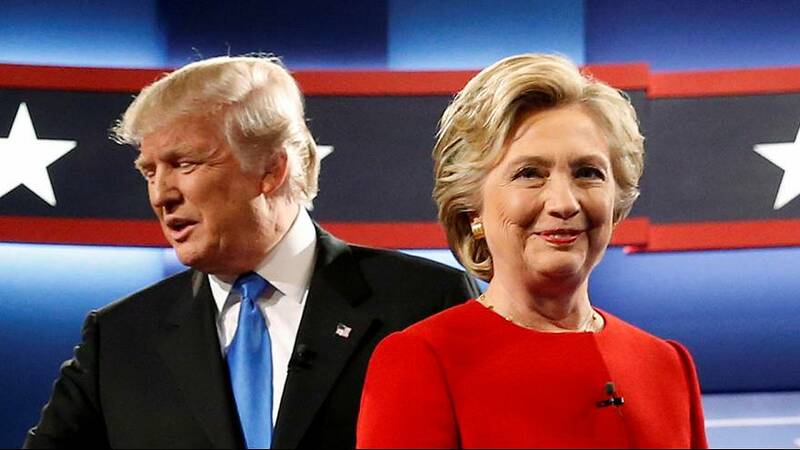 In the New York showdown, the U.S. presidential candidates Donald Trump and Hillary Clinton clashed over economy, security and terrorism. He didn't throw up on his shoes but he couldn't prevent Hillary Clinton from having one of her strongest nights in the campaign either. Donald Trump was not as prepared as Hillary Clinton. While Trump tried to present himself as a successful businessman and Clinton as political establishment, his rival managed to control the evening thanks to her political experience. “Under my plan I’ll be reducing taxes tremendously from 35 percent to 15 percent for companies small and big businesses. That’s going to be a job creator like we haven’t seen since Ronald Reagan,” said Trump, the Republican candidate. “The kind of plan that Donald has put forth would be trickle-down economics again. In fact, it would be the most extreme version — the biggest tax cuts for the top percents of the people in this country than we’ve ever had. I call it ‘trumped-up, trickled down’, because that’s exactly what it would be. That is not how we grow the economy,” retorted Clinton. Trump was thrown on the defensive for not disclosing his tax returns. He countered by bringing up the affair about Clinton using her private email server while serving as as secretary of state. “Why won’t he release his tax returns and I think there may be a couple of reasons. First, maybe he’s not as rich as he says he is. Second, maybe he’s not as charitable as he claims to be,” charged Clinton. “I will release my tax returns against my lawyers wishes when she releases her 33,000 e-mails that have been deleted, as soon as she releases them. I will release,” replied Trump. “You know, I made a mistake using a private e-mail,” admitted Clinton. “That’s for sure,” Trump added. “And if I had to do it over again, I would, obviously, do it differently. But I’m not going to make any excuses. It was a mistake, and I take responsibility for that,” insisted Clinton. Trump made Clinton’s policies responsible for a range of problems facing the country including the threat posed by the so called Islamic State. “This is something that never should have happened. It should never happened. Now, you’re talking about taking out ISIS but you were there and you were secretary of state when it was a little infant. Now, it’s in over 30 countries. And, you’re going to stop them? I don’t think so,” said Trump. Alasdair Sandford, euronews: The majority view seems to be advantage Clinton after this first TV debate… What reaction has there been? Stefan Grobe, euronews US correspondent: Well, Alasdair, the overwhelming consensus among commentators is that Donald Trump barely survived. He didn’t throw up on his shoes but he couldn’t prevent Hillary Clinton from having one of her strongest nights in the campaign either. Donald Trump was not as prepared as Hillary Clinton; he struggled with the facts, he struggled with policy issues; and he spent a big chunk of the evening defending himself, which is almost a bad thing. Hillary Clinton on the other hand stayed very, very calm, very confident – at times she was funny and witty and she parried all the attacks by Trump pretty easily, so it could be debated whether she won the debate. Clearly Trump lost it and if you were a Trump campaign supporter you won’t be happy today and in the days ahead. AS: The crucial question of course is how does this play with undecided voters. Is there any indications as to how they’ve responded? SG: Now, there’s only a very slim part of the electorate that’s still undecided after a year and half of campaigning believe it or not. Many of these voters are third party supporters. Now there are two third-party candidates who poll around 10 percent combined and the strongest one is Gary Johnson, the former New Mexico Republican governor, and his supporters are mostly never-Trump Republicans. So, these people are now taking a second look at both candidates and what they’re seeing is that Hillary Clinton was the far more presidential and far more competent and confident candidate. My guess is that many of these supporters will eventually rally around Hillary Clinton. AS: There’s a still a long way to go to the election in November so how important was this debate? SG: People say it’s always the first debate that matters and then afterwards, watching the debate for 90 minutes many people are turned off and traditionally the second debate is a low-point, in terms of audience, and the third debate we have a little uptake of viewers here. It’s hard to tell whether this particular debate will change the narrative. It will certainly make Democrats happy because, let’s not forget, Hillary Clinton’s problem is that she has not, so far, energised her Democratic base in the way Barack Obama did four and eight years ago. She just needs all the voters who turned out for him to turn out again and vote for her. She hasn’t done that yet. AS: Stefan Grobe, euronews correspondent in Washington, thank you.